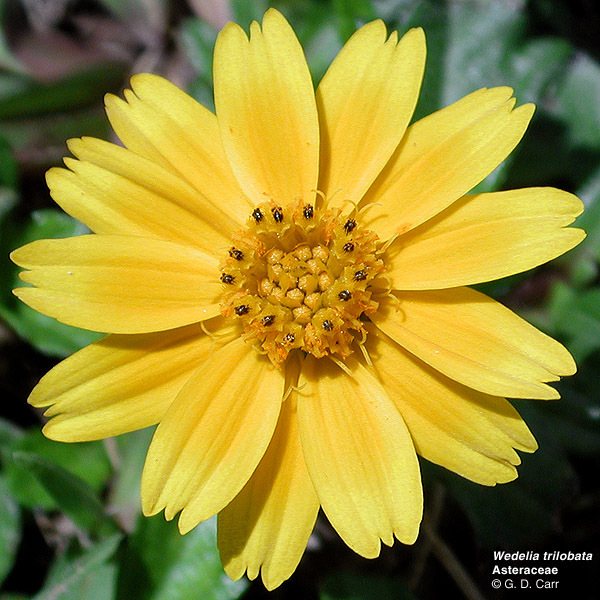 The Heliantheae have traditionally been treated as a very large and somewhat heterogeneous assemblage of Asteraceae with as many as 24 subtribes ("Flora North America" (2006). The more recent treatment of the tribe in "Systematics, Evolution, & Biogeography of Compositae" (2009) is considerably streamlined, with several groups of genera removed to other tribes. This has resulted in a more cohesive assemblage of 1461 species in 113 genera dispersed among 14 subtribes. Recognition of members of the tribe is ordinarily facilitated by the association of a receptacular bract or chaff scale with each disk floret in the head. The heads usually include bisexual, actinomorphic disk florets with tubular corollas that have 4 or 5 distal lobes and also peripheral zygomorphic female or sometimes sterile florets with strap-shaped corollas that have 3 or fewer distal teeth. 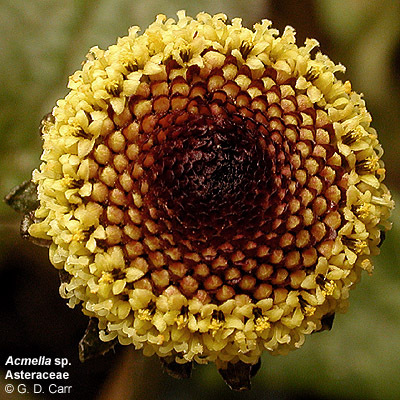 However, the ray flowers are sometimes absent and the heads are then discoid, containing only bisexual florets with tubular corollas. The pappus is absent or more commonly ranges from scales to stiff bristles. Calyptocarpus vialis, straggler daisy, prostrate lawnflower (Ecliptinae), UHM Campus, Manoa, HI. 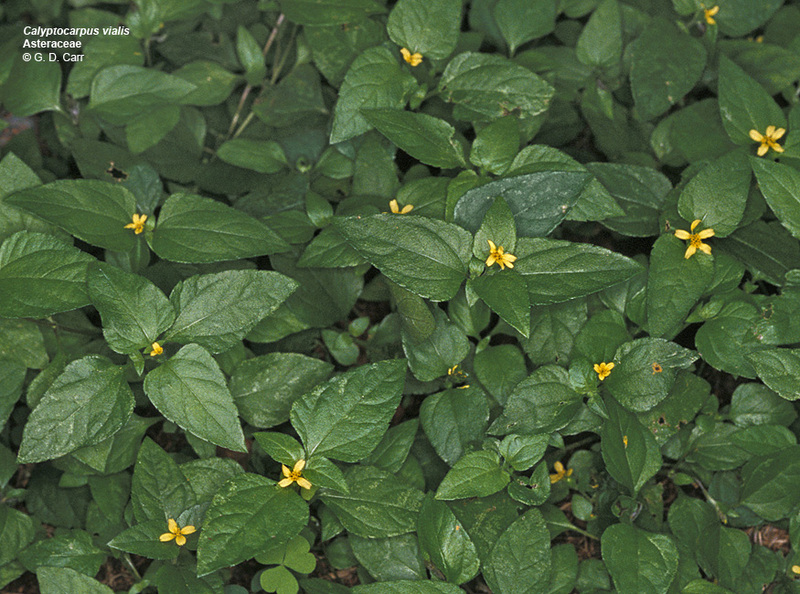 Melanthera (Lipochaeta) remyi, nehe (Ecliptinae). 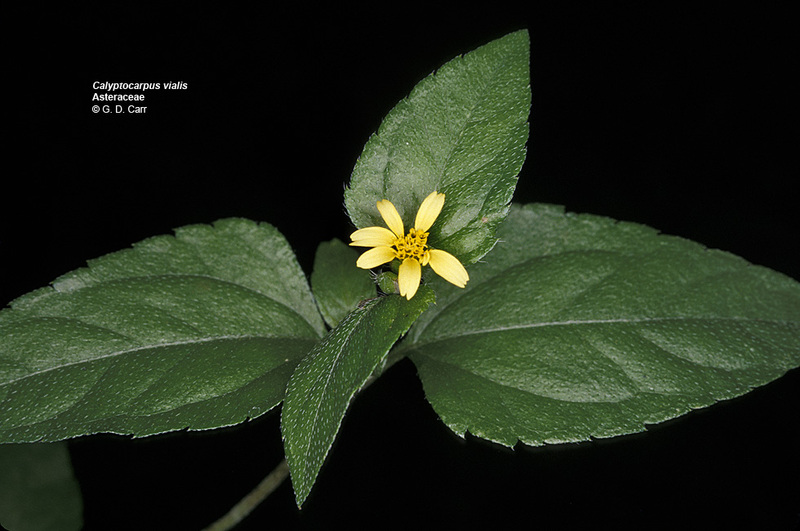 This Hawaiian endemic has female ray flowers and bisexual disk flowers. 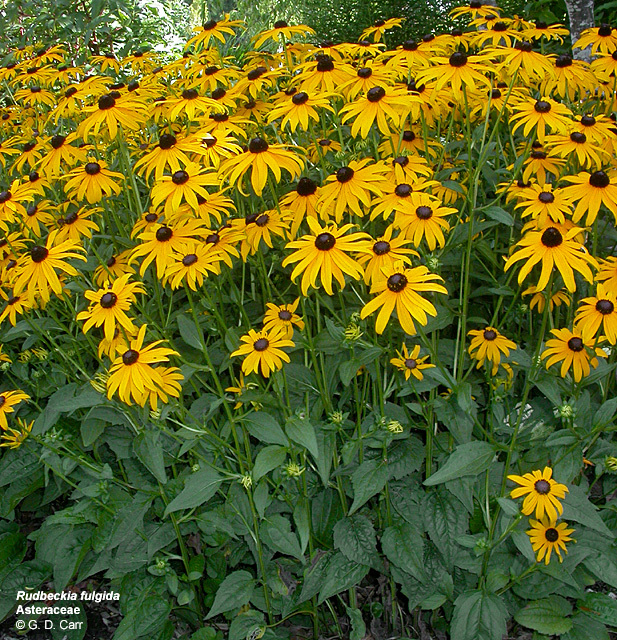 The upper heads are in an early fruiting stage and show persistent, conspicuous yellowish green receptacular bracts in the center of the heads and darker, purple-marked involucral bracts at the periphery. 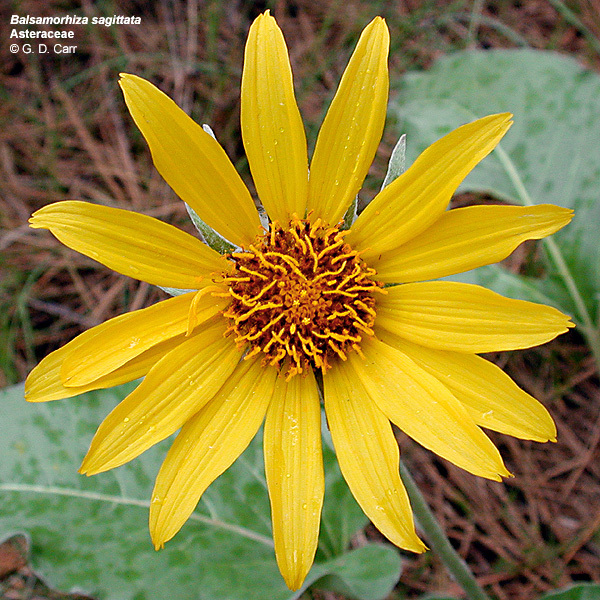 Sphagneticola trilobata (syn. 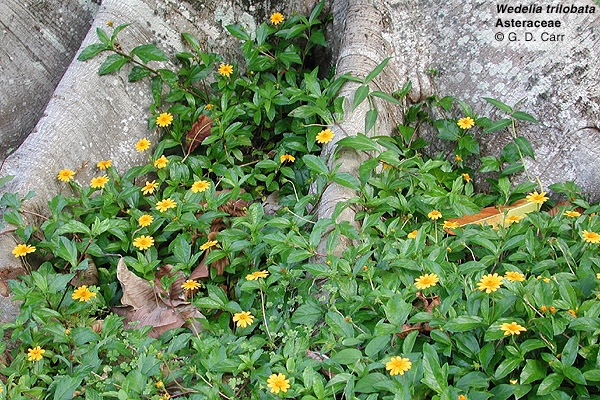 Wedelia trilobata), wedelia (Ecliptinae). 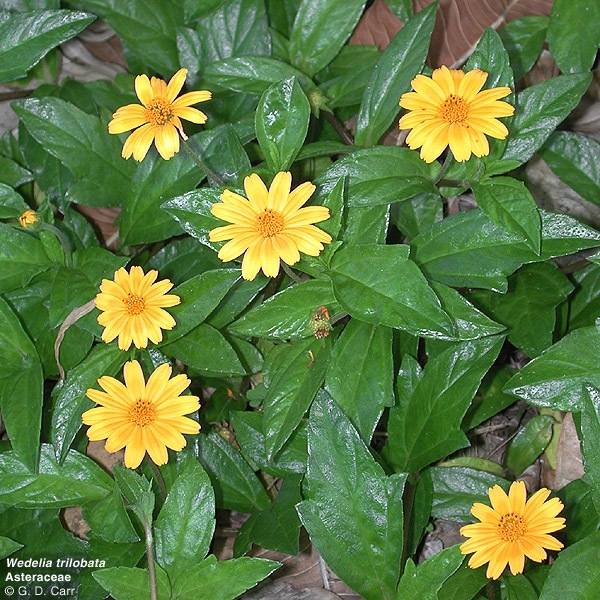 Creeping herb from tropical America, with yellow flowering heads, commonly used for a ground cover. This species can hybridize with species in the Hawaiian genus Lipochaeta. 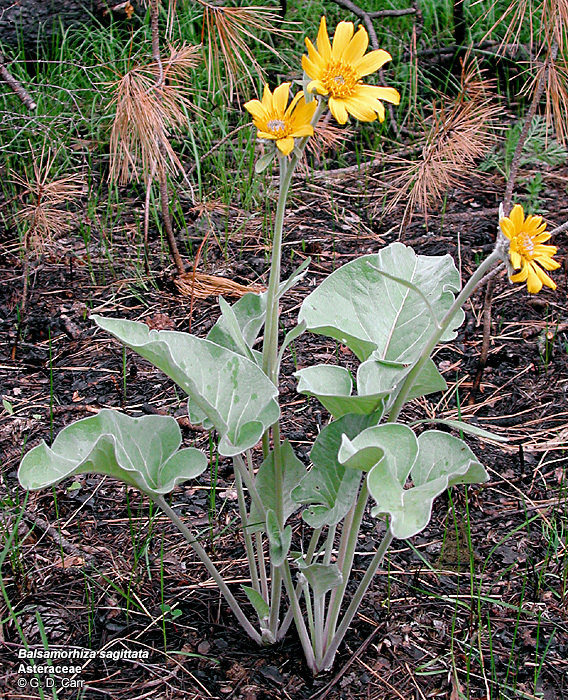 Balsamorhiza sagittata (Engelmanniinae), balsam root, vic. Cheney, WA, 2002. 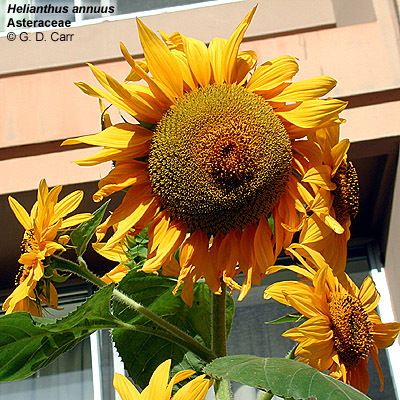 Helianthus annuus, sunflower (Helianthinae). 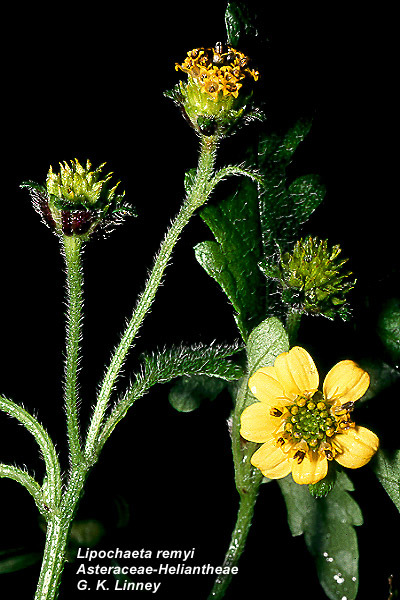 Note the conspicuous green involucral bracts or phyllaries outside and below the peripheral ray flowers. 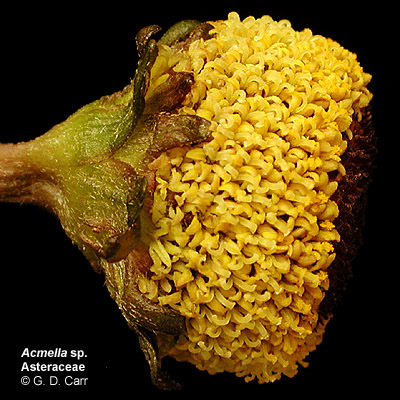 On the right are several intact disk flowers, each with a greenish corolla tube and 5 yellow lobes. Parts of several florets have been removed to reveal the white, inferior ovaries, a few of which still have one or both of the very pale pappus scales attached to their summits at the flanks of the tiny annular nectary that encircles the scar where the style was attached. 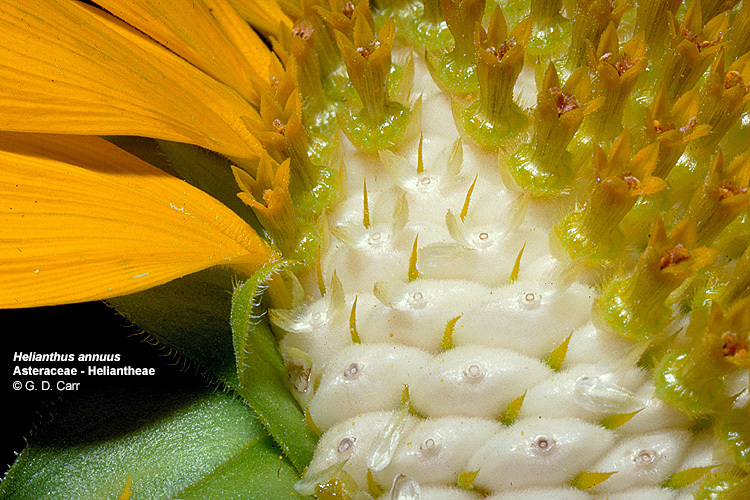 The tip of a yellowish green receptacular bract can be seen at the outer or left edge of each ovary in view. Scalesia bauri ssp. 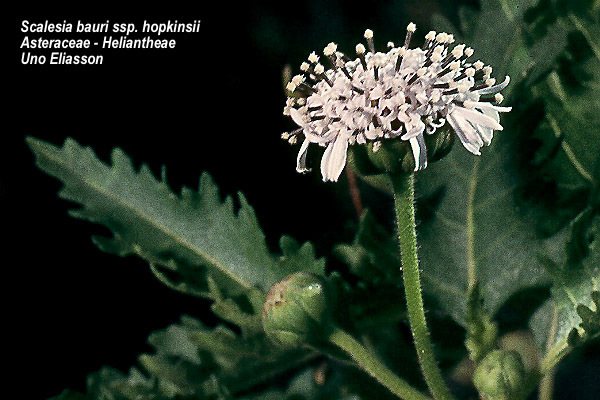 hopkinsii (Helianthinae). Scalesia helleri (Helianthinae). 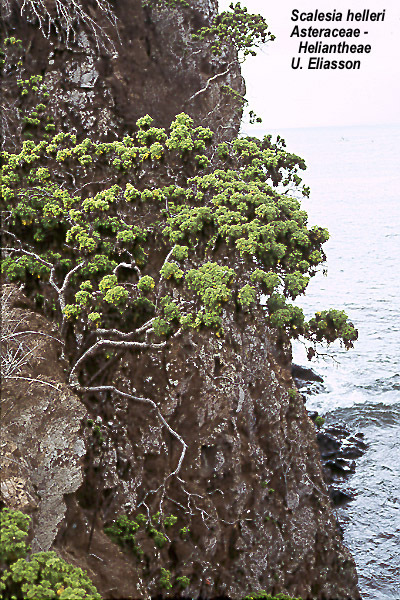 This genus from the Galapagos Islands shows a radiation of woody forms similar to that seen in the genus Dubautia of the silversword alliance in Hawai'i (Madieae). 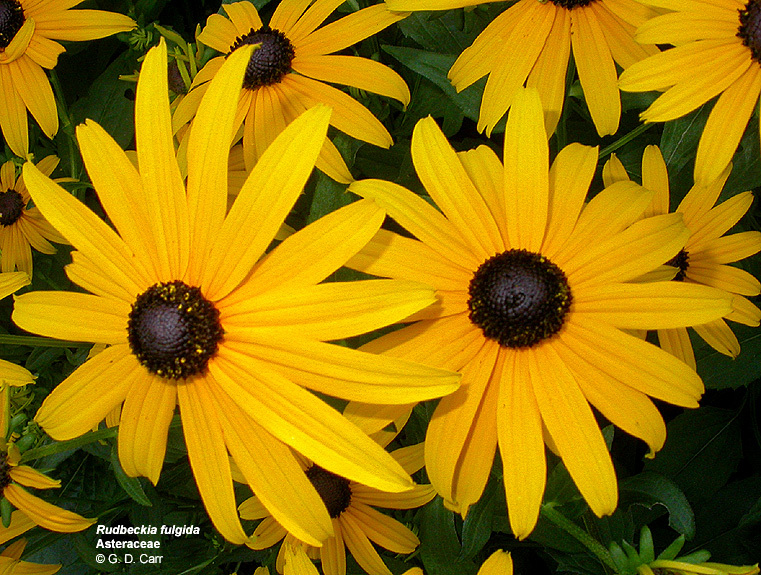 Rudbeckia fulgida, brown-eyed Susan (Rudbeckiinae), OSU Campus, Corvallis, OR, July, 2003. 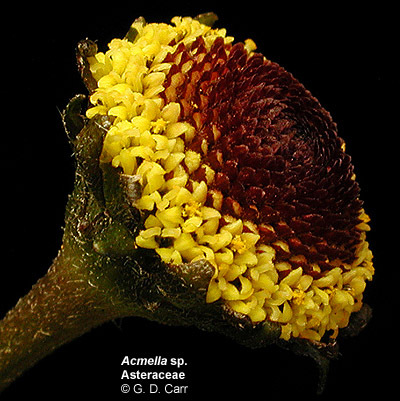 Acmella sp. (Spilanthinae) Note the rayless heads and reddish brown chaff scales (receptacular bracts), one associated with each floret. 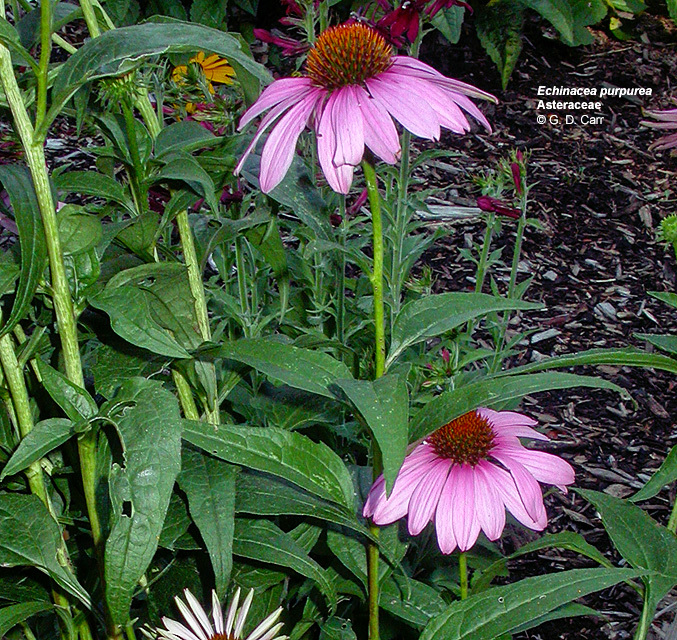 Echinacea purpurea, echinacea (Zinniinae), OSU Campus, Corvallis, OR, July, 2003. 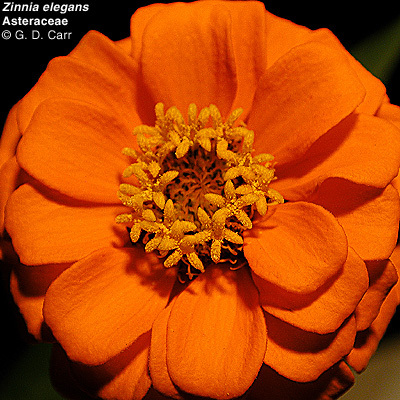 Zinnia elegans, zinnia (Zinniinae), annual ornamental species.